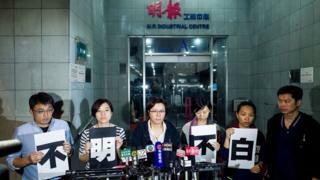 Journalists in Hong Kong have said they are "shocked and disturbed" by the sacking of an editor at prominent newspaper Ming Pao. Ming Pao's management said on Wednesday that Keung Kwok-yuen was dismissed in a cost-cutting exercise. But journalist unions and the paper's staff have said they believe it was a politically motivated move. Ming Pao ran a story on Wednesday about Hong Kong politicians and individuals named in the Panama Papers leak. The papers, leaked from a Panama law firm, exposed offshore business dealings by the rich and powerful around the world. The sudden departure of veteran editor Mr Keung comes amid increasing concern in Hong Kong about the territory's freedoms within China. Mr Keung, who was executive chief editor, was dismissed late on Tuesday night with immediate effect. Editor-in-chief Chong Tien Siong said it was a resources decision in a "difficult business environment". But the paper's staff association expressed "extreme dissatisfaction and anger", and asked whether the sacking was about "punishing staff members who have different opinions on editorial issues". On Wednesday, staff members staged a protest outside the newspaper's offices. A joint statement by eight other journalists' associations in Hong Kong said the public was owed an explanation. The sacking comes two years after the paper's then chief editor Kevin Lau was also dismissed, and replaced by Mr Chong, who was widely seen as more pro-Beijing. Mr Lau was later stabbed by two men who fled to mainland China and were subsequently jailed. They alleged they had been paid to carry out the attack but refused to say by whom.